The Supermarine Spitfire is arguably the most iconic British fighter of World War II. Renowned both for its beauty and its warfighting utility, over 20,000 Spitfires were produced over a period of 10 years in more than 20 variants. The Spitfire’s versatility was unmatched, as it served in many roles in all major theatres. From a front line fighter to high altitude inceptor, including roles as a reconnaissance platform and fighter bomber, the Spitfire was the backbone of the Royal Air Force after the Battle of Britain. Powered by Rolls-Royce Merlin and later Griffon engines, the Spitfire maintained an edge throughout the war as a superior warplane. To honor this aircraft and the heroic crews who served with it, FlightLineRC presents its Supermarine Spitfire in the popular Mk.IX variant. Constructed using EPO foam and painted with matte finish scale colors, this 1200mm wingspan model uses carbon tubes and plastic parts to reinforce the removable wings and control surfaces for durable handling. The wing and elevator can be easily removed in seconds for convenient transport. 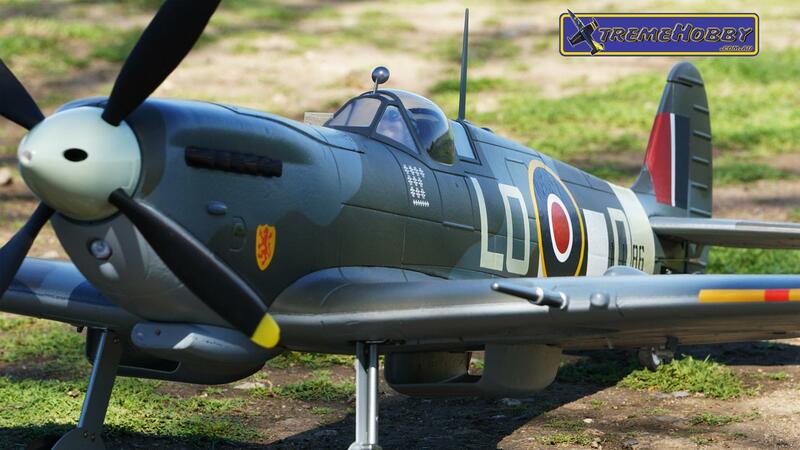 FlightLineRC captures the beautiful classic lines of the Spitfire Mk.IX with an accurate cowl shape, exhaust stacks, and accurate canopy outline complete with a scale rear view mirror. Split flaps, radiators, two optional air filters, and two optional decal sets are included in the box to provide pilots with multiple customizing options. Choose from either Commander Pierre Clostermann’s LO-D or Lt. Colonel James “Johnnie” Johnson’s JE-J. FlightLineRC’s Spitfire Mk.IX features a scale four bladed propeller and 580kv motor to achieve satisfying scale performance at 135kph/83mph top speeds. An optional two bladed power system (sold separately) can be purchased to reach 150kph/93mph level speeds on the same 4s 14.8v battery. The Spitfire also features oversized retracts with metal trunions and metal reinforcing plates. Slightly oversized tires help to minimize nose overs. With the recommended 4s 2650 mAh battery we obtain 5-6 minutes of mixed throttle scale flight. The model can also accommodate an 4s 3000mAh or even 4s 4000mAh battery for longer flight times, but the 2650mAh and 3000mAh are the best balance between speed, vertical power, flight duration, and wing loading.